I was given 2 seconds to take these pictures before the other fisherman returned to see my husband holding up a quilt. So those cute little kids are playing ring-around-the-rosies upside down all over the quilt. The trickiest part of this quilt for me is spacing all of the colors and fabrics evenly. It took me a ridiculously long time to lay it out and stare at it before it got sewn together. And in other exciting news….we caught a fish! We only had to go fishing 19 times but hey…at least it’s a big fish. It’s a darn good thing too because my sewing machine is getting dusty. I like how the little fisherman matches your pretty quilt! I love these fabrics, I just made me a baby quilt out of a charm pack.. I can't wait for the yardage to arrive so I can finished the back.. thanks for sharing! Am I confused? I don't see the apple core pattern, so are there apples printed in the fabric? I'm feeling your pain, but greatly admiring your commitment to family time. My husband had me stationed in front of the flat screen a few nights ago watching an episode of Swamp People in a valiant effort of "togetherness". No joke. Painful. Love the quilt, even if it *is* upside down. The colors are so happy and bright, and love the prints. P.S. Congrats on the fish! I love your quilt!! And congrats on that big fish!!! I had to laugh. I think my hubby would have rushed to remove himself of quilt holding duties too if his pals were on the horizon about to see him!! Great fish….who caught it? Love the quilt top. And wanted to say I did your sprocket pillow, the big one, and it graces my bed in the motorhome. Love it. Makes me smile! I bought the charm pack yesterday!! I'm planning to make a quilt for a friend's baby (I'm figuring it's pretty unisex). So nice to see it looking beautiful – I can't wait to start sewing now. Love it! It would have taken me forever to get the colors and patterns just right too. Nice fish too! Such a cute quilt! And wow, that's a big fish! Beautiful quilt, love the fisherman. I have five grandsons who all love fishing. Yea for fish! Also, yea for hubbies who hold up quilts for pics. Quilts with feets and fingers are a hoot. Beautiful as always Allison! I have a question though – when you are selecting your 9 patches in the beginning, do you use a specific grouping order, or just place them randomly till they look right? I never know what is best to make the finished blocks perfect. I'm doing a disappearing nine patch after the Bizzy Kids one I just started, so I'd love to know your thoughts! This is beautiful, I love it! 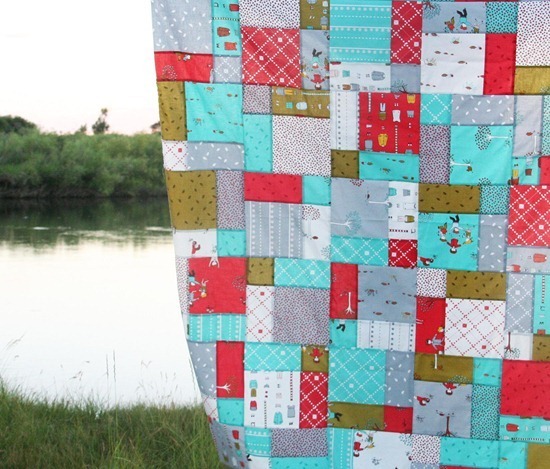 Every time I visit your blog I think it's time for me to try to make a quilt… Hopefully one day soon! Tell your husband that 'real men hold quilts'. Grin. Darling quilt any way you look at it! I think I spend more time rearranging blocks in quilts like this than I do sewing, but rest assured, you did a wonderful job! I'm thinking that is a fish worth waiting for! Where can we get this quilt pattern? I LOVE IT! 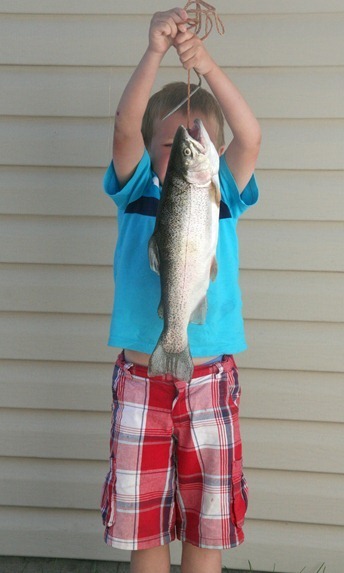 I'm sure this fish will be a memory that lasts a lifetime for your little guy. Some of the sweetest memories of my children's childhood were when we took them fishing. Beautiful quilt! Love the colours. 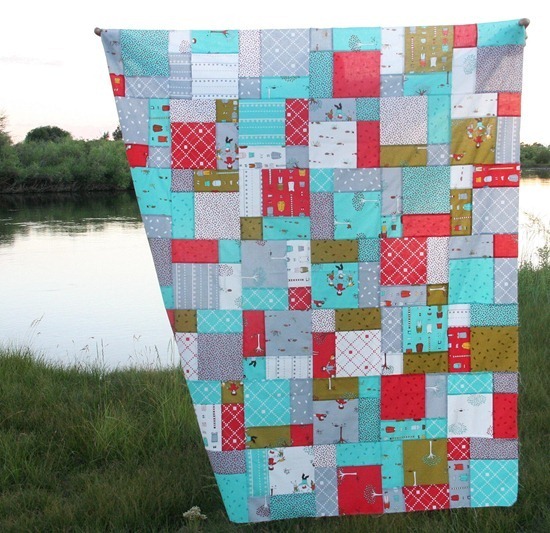 Darling quilt in a fun setting! Love the little quilt – I've got some of that to play with myself, can't wait to start!! Some bodyy is tickled with that catch! Love the quilt. Would you be so kind to (& tell your friends) comment on my BLOG ONLY (emails don’t count), for the Miracle Makeover fund drive. Charlie, 8 yr. old, & his story are fabulous. Every comment brings us a $1 for the next person that will be sponsored. I love the colours and prints in this line – and you have put it together really well! I love how the red pops! Beautiful. Through a friend, my daughter was able to acquire this fabric line ahead of release. She turned it into a quilt she presented to me before she left for college. I'd never been given a quilt before and to say it brought me to tears is an understatement. I love the fabric, but of course, it's the love she poured into it as she secretly made it for me.